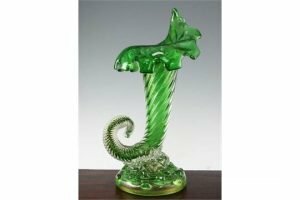 A large Murano green and clear cased glass cornucopia, first half 20th century, with aventurine gold fleck inclusions, on a nobbly circular base. 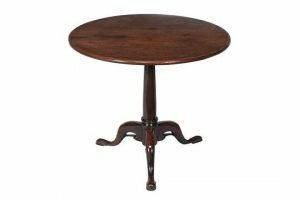 A George II mahogany tripod table, circa 1750, the circular top with turned barrel stem above three cabriole shaped downswept legs with pierced detail, on pad feet. 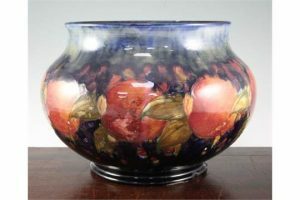 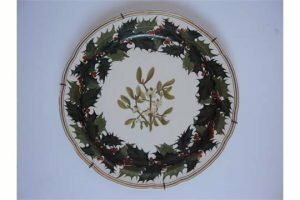 A large Moorcroft pomegranate baluster shaped jardiniere, c.1917, with mottled green/cobalt blue ground. 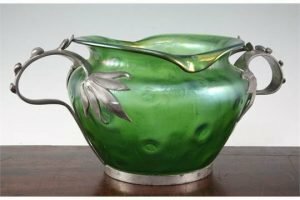 A Loetz style Art Nouveau iridescent green glass and pewter mounted bowl, c.1905, the dimple moulded glass bowl flanked by a pair of pewter bifurcated flower and tendril handles. 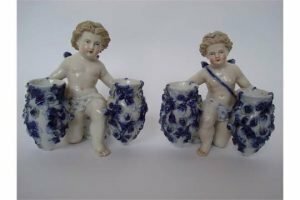 A pair of late 19th Century Sitzendorf figures of putti, on bended knee holding a pair of flower encrusted vases, decorated in underglaze blue and colour enamel. 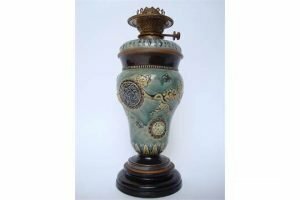 A Doulton Lambeth glazed stoneware oil lamp decorated by Harriet E Hibbut, of inverted baluster form, decorated in raised relief with flower prunus branches, butterflies and panels filled with perched birds, a coiled snake and a goldfish, on plinth base. 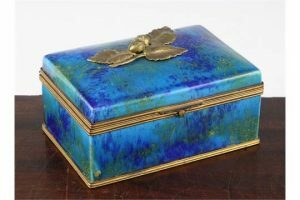 A Sevres turquoise blue and green souffle glazed box and cover, 1930’s, probably Paul Milet, with gilt bronze bud and leaf mounts and mounted hinge and base. 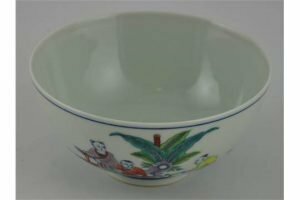 A Chinese Doucai tea bowl, decorated with a scene of children at play, bears a six character Yongzheng mark to base. 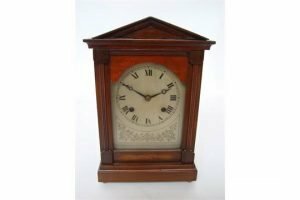 An early 20th Century mahogany cased architectural mantle clock, the silvered foliate engraved dial with Roman numerals and minute track, eight day brass movement striking on a gong with half hour strike. 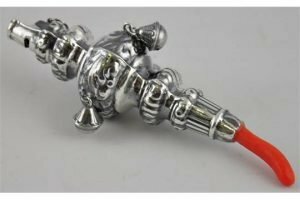 A Continental 800 standard silver baby’s rattle combined whistle, bell hung with coral teether. 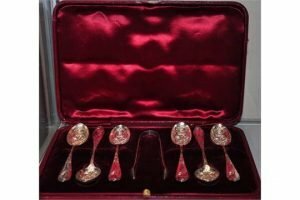 A set of six Victorian silver teaspoons and tongs with floral embossed decoration, cased. 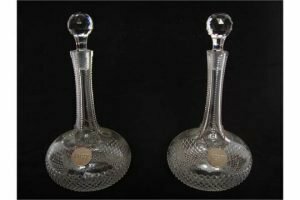 A pair of late Victorian shaft and globe decanters and stoppers, the body moulded with relief diamonds and engraved with roses, each with an Edwardian silver disc decanter label ‘Sherry’ and ‘Port’. 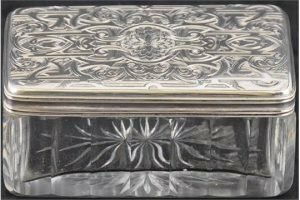 A Victorian solid silver and cut glass dressing table box hallmarked 1885. 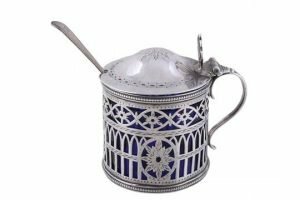 A George III Irish silver drum mustard pot by Joseph Jackson, the domed cover with a pierced shell thumb piece, an S-scroll handle, beaded edges and pierced with patera and bars, with an associated blue glass liner. 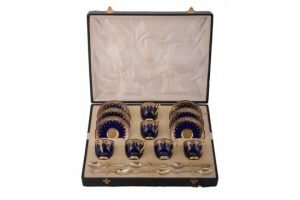 A set of six Royal Worcester bone china coffee cups and saucers, puce printed marks, pattern C.900; and a set of six silver gilt coffee spoons by Henry James Hulbert, London 1925. 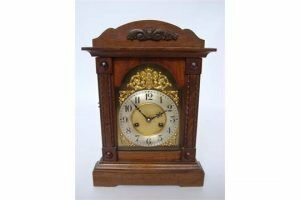 An early 20th Century H.A.C Wurttemberg German walnut mantel clock, the arched brass dial with cast spandrels and silvered dial, with Arabic numerals, brass 14 day gong striking movement, with hour strike and with pendulum and key. 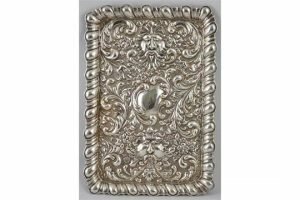 An Edwardian rectangular embossed silver dressing table tray, decorated with cartouche C scrolls and stylised masks, Birmingham 1904. 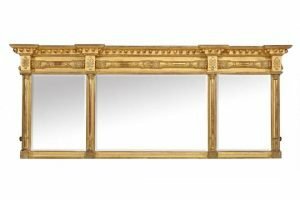 A George IV giltwood and composition over mantle mirror, circa 1825, the moulded cornice above triple mirror plates and flanking cluster column pilasters. 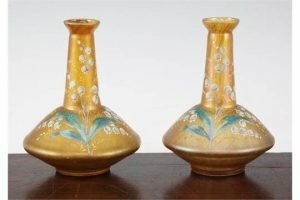 A pair of Bohemian enamelled lustre bottle vases, early 20th century, decorated with snowdrops and foliate, on an orange lustrous ground, gilt rims.